Prominent & Leading Manufacturer from New Delhi, we offer alc700 lighting tower controller. ALC700 Lighting Tower Controller series controllers are used for automation and monitor control systems of single light tower unit to achieve scheduled start/stop, sunrise and sunset start/stop, SMS message remote start/stop as well as start/stop genset via remote input port. 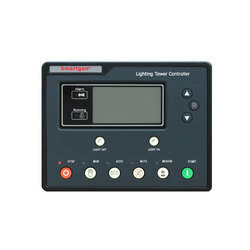 ALC700 series controllers can be used for turning on and off the flashlights of the light tower in proper order and is compatible with both AC and DC light tower sets. The modules are digital, smart and networked and enjoy precise data measurement, alarm protection as well as remote control, remote measuring and remote communication functions. ALC700 series controllers adopt micro-processor technology and combine automation control function with flashlights control function into one product. They have LCD display, selectable Chinese/English languages interface, modular design, compact structure and simple connections. They can be widely used in all types of automatic light tower set with compact structure, advanced circuits, and high reliability.